Toolbar Captions. Finally XYplorer’s newbie-friendliness extends to the toolbar. If you ever wanted to know what those colorful toolbar buttons actually do, this version comes with optional captions. Sync Caps. Now Sync Folders ensures that the capitalization (lower/upper case letters in the item names) of the target files and folders exactly matches that of the source items. Filtered Sync. Now you can explicitly include and exclude files and folders from Sync Folders by passing a list of patterns to the job. Wildcards supported. Scripting abilities needed. Shortcut Overlays. Now you can say no to shortcut overlays. Drag Status Box. The Drag Status Box™ is a color-coded information box shown at the mouse pointer when hovering over a drop target. Prevent Unwanted Dragging. Now you can disallow dragging from folder tree and file list independently. Lets you for example protect the tree from potentially disastrous drag-and-drop mistakes while keeping the list drag-ready to rock. Toolbar Font Size. Now Ctrl+Wheel over the Toolbar changes the button captions font size on the fly and with high granularity. XYplorer’s zero click wonder, the HoverBox, now supports thumbnail previews for text, image, video, office, and PDF files. A pleasure for your eyes and your tendons. Immediate addiction guaranteed. Optionally you can now select list items by just hovering their icon. Another comfy zero click service. The new "Find hidden" option lets you find all items regardless of any settings that might currently hide them. This Is A BIG Maintenance Release. 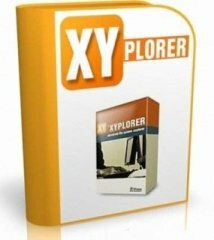 A major Windows 10 related issue regarding XYplorer’s portable devices support has been finally resolved, and there have been numerous minor fixes and enhancements since 19.00. Folder Contents Preview. Now you can get a folder contents preview in the Hover Box. Simply hover a folder and see its top 20 items instantly listed in a small popup. Works in the folder tree and the file list. Addictive is an understatement. This will change the way you work. Your file management will become smooth and silent through a reduction of futile clicks. Mouse Up Show Down. Now it’s available also in the folder tree. Like in the List it works on mouse up on the folder icons. Lets you quickly peek into folders without leaving the current location. Lets you even list and open files right from the tree. Canvas Color Toggle. Now you can quickly toggle the background color of the Hover Box for images. Cool feature for photographers. Invalid Filename Warning. Now you get a warning in the status bar when a file or folder with an invalid filename (invalid in the Windows shell, not in NTFS) is selected in the file list. Leading or trailing spaces are made visible by a replacement character. Horizontal Scrolling. Now Shift+Wheel horizontally scrolls folder tree and file list.